Buzz Aldrin, co-pilot of the Apollo 11 mission, in 1969, on the lunar surface with the Omega Speedmaster on the right sleeve of his spacesuit. 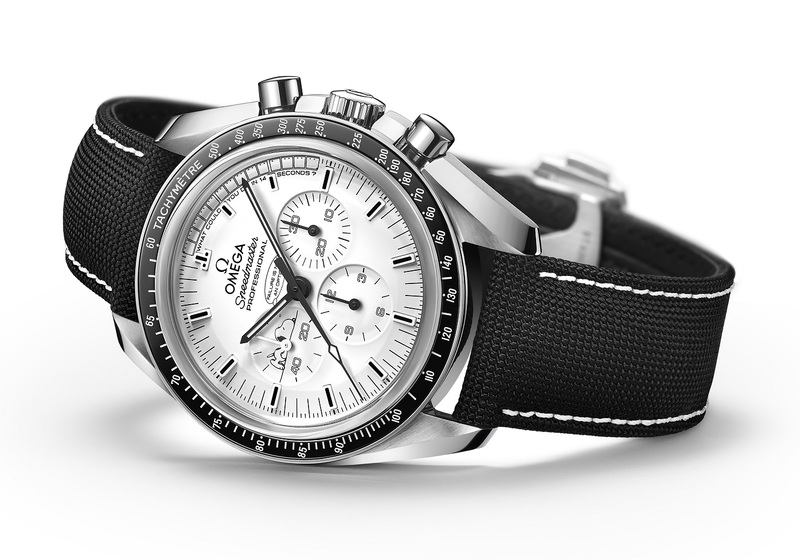 The official status of Omega’s Speedmaster as that of Moonwatch is widely celebrated. The Omega Speedmaster underwent a series of tests by NASA—the most rigorous of horology—including 40 g-force shocks. 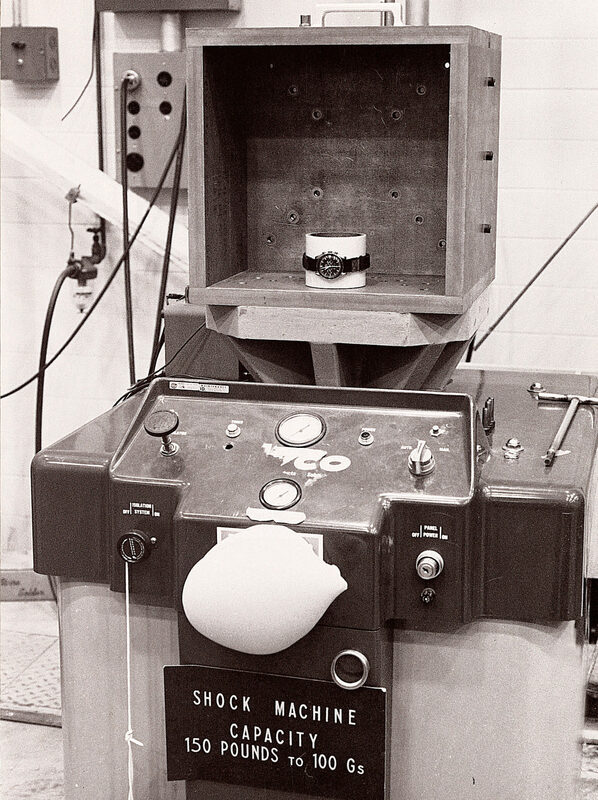 During NASA’s tests, the watches were subjected to temperatures ranging from 71°C to 93°C, over a two-day period, after which they were frozen at -18°C. 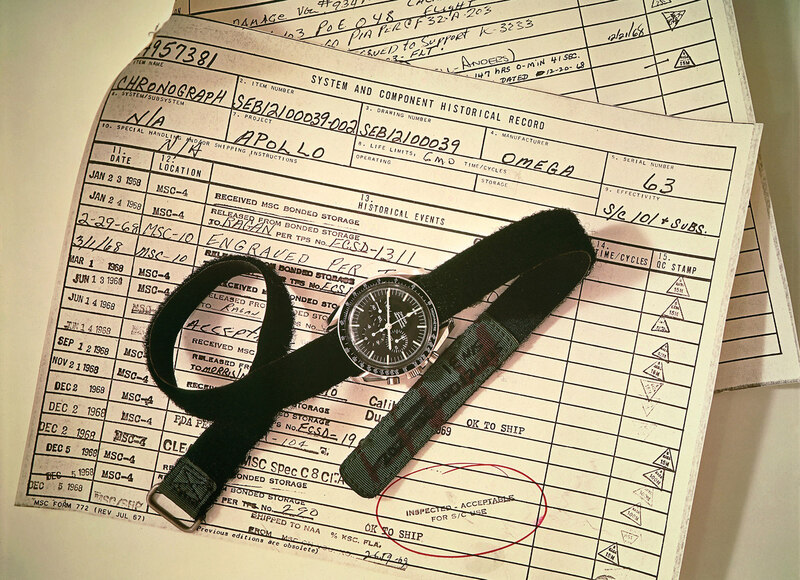 In March 1965, the Omega Speedmaster was declared “Flight Qualified for all Manned Spaced Missions”. 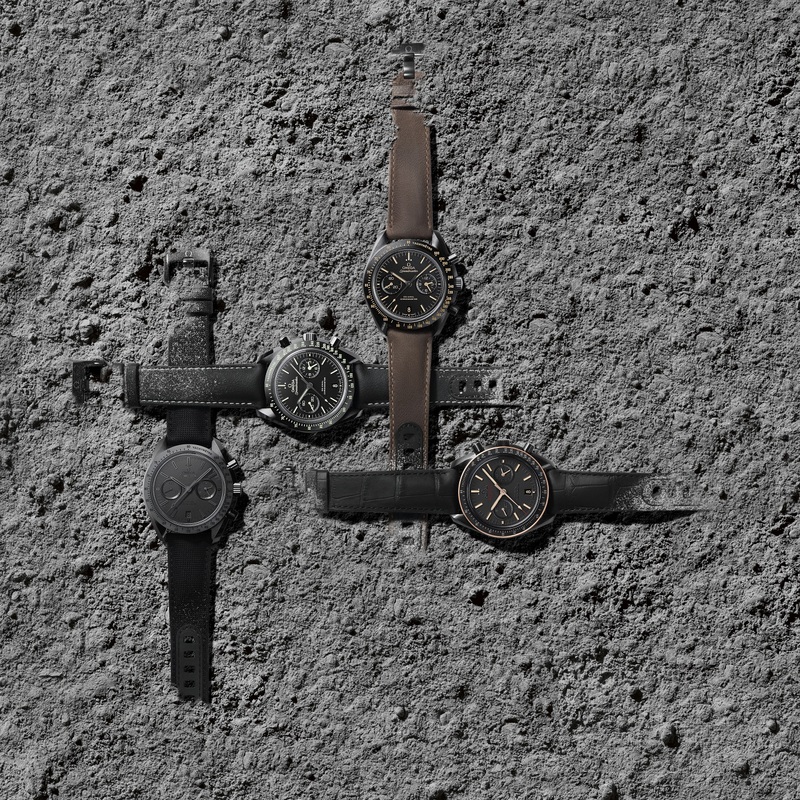 The Dark Side of the Moon collection, the latest iteration of the Omega Speedmaster, includes Black Black, Vintage Black, Sedna Black, and Pitch Black. To commemorate the 45th anniversary of the Apollo 13, Omega has released a limited-edition timepiece, the Omega Speedmaster Apollo 13 Silver Snoopy. The Omega Speedmaster: first watch on the moon. President Kennedy’s vision came true, of course. 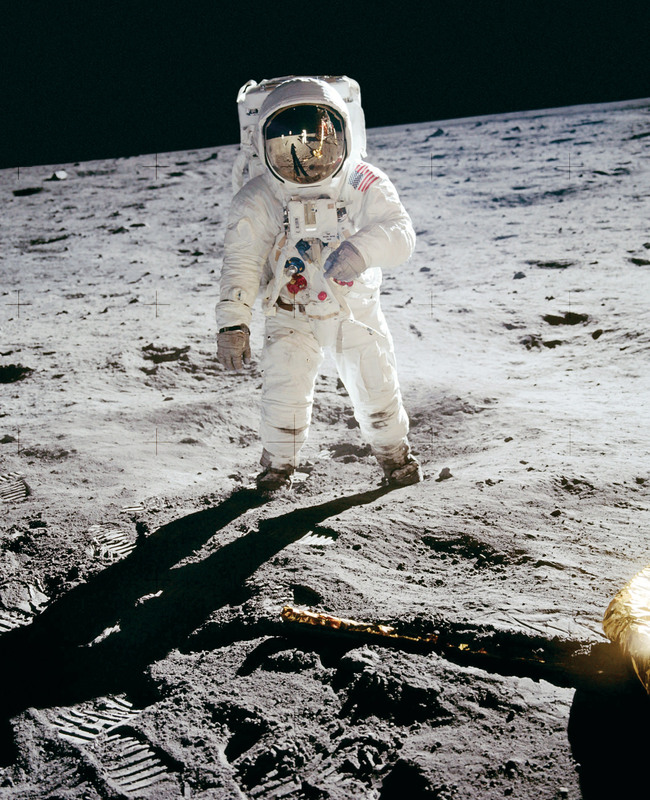 On July 20, 1969, at 2:56 GMT, the late astronaut Neil Armstrong stepped onto the lunar surface. On that day, Armstrong and his co-pilot, Col. Edwin E. Aldrin Jr., known as Buzz, steered their lunar landing craft, Eagle, to a rock-strewn plain near the southwestern shore of the Sea of Tranquillity. The Speedmaster’s association with space exploration began in 1962 when NASA astronaut Walter “Wally” Schirra purchased his flight watch: the second generation Speedmaster model with the reference CK2998. Schirra’s personal chronograph was the very first Speedmaster to fly on a space mission during the Mercury-Atlas 8 (Sigma 7) mission. Two years later, astronaut Donald Kent “Deke” Slayton issued an internal memo stating the need for a “highly durable and accurate chronograph to be used by flight crews.” The memo landed on the desk of NASA engineer James Ragan, who sent a Request for Quotations and a specification sheet for wrist chronographs to various manufacturers (Breitling, Longines, and Rolex among them). Omega’s copy of the request was received by its U.S. affiliate in New York, who proposed and delivered three Speedmasters with the reference ST105.003. The watches underwent a series of tests by NASA—the most rigorous trials endured in the history of horology. The watches were subjected to high temperatures ranging from 71°C to 93°C, over a two-day period, after which they were frozen at -18°C; they were given a rapid succession 15-cycle test where they were heated to 71°C for 45 minutes and then immediately cooled to -18°C for 45 minutes; they spent 240 hours in a relative-humidity atmosphere of 93 per cent and 48 hours in an atmosphere of highly corrosive 100 per cent oxygen; they endured noise levels reaching 130 decibels; they were placed in a vacuum chamber heated to 93°C; they were vibrated for three 30-minute cycles with average accelerations of 8.8 g-force per impulse; they endured shock tests of 40 g-force shocks in six different directions. In the end, the Omega Speedmaster was the sole survivor. 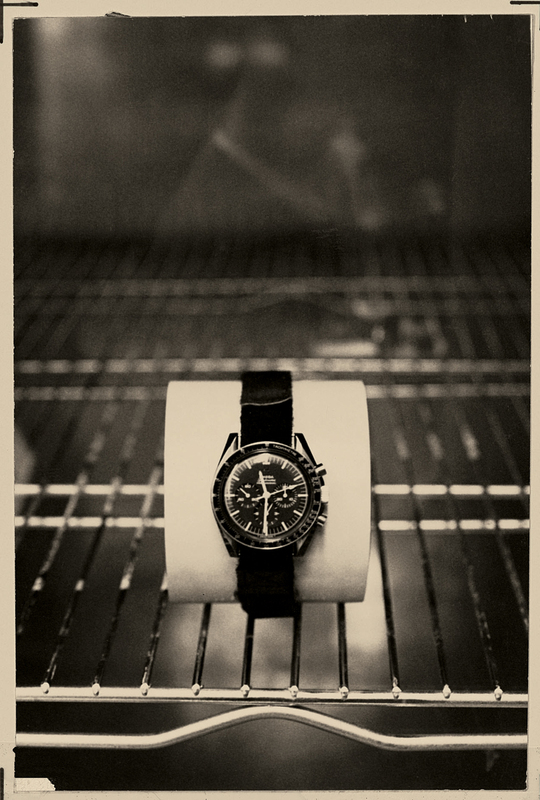 In March 1965, the Omega Speedmaster was declared “Flight Qualified for all Manned Spaced Missions”. 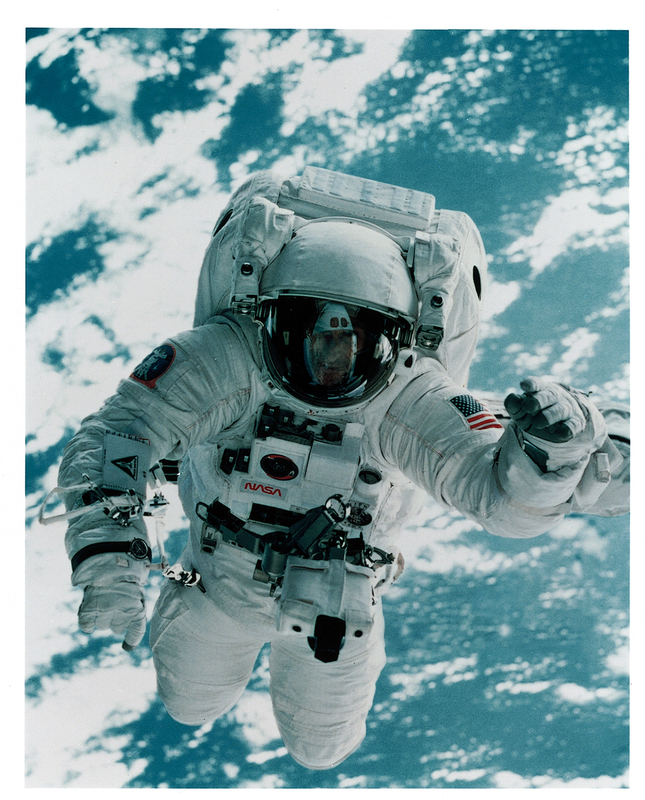 Curiously, Omega only learned about the Speedmaster’s journey into space after seeing a photograph of Edward Higgins “Ed” White taken during America’s first spacewalk as part of the Gemini 4 mission in June of that year. The watches underwent a series of tests by NASA—the most rigorous trials endured in the history of horology. It’s not hard to believe that those who grew up in the sixties wanted the watch that went to the moon. It was that simple. What’s really impressive is that the desire was sustained; children of the children of the sixties have inherited the want. Most watch-lovers will agree that a genuinely rounded collection includes at least one Speedmaster. Of all the models out there, it’s also one of the most evolved, with later variants holding their desirability next to a vintage piece. The official status of Omega’s Speedmaster as that of Moonwatch is widely celebrated, and yet, did it make a difference up there? Did it do enough to deserve the canonical place it has in the watch landscape? Is the Moonwatch’s legend large enough to justify the new Speedmaster models released at Baselworld this year? The astronauts abandoned the command module and took refuge in the lunar module, which only had limited power. “We had one last manoeuvre,” continues Lovell in a clearly tense recollection. “We found out from mission control that we were not on the proper course to make a safe landing through the atmosphere. We had to use the Omega watch to time the 14-second burn of a lunar module engine to back into the proper corridor to come back in and make a safe landing.” Timing is critical on re-entry because astronauts must make regular corrections to the path to ensure that the craft hits Earth’s atmosphere in precisely the right way. Come in too fast and the craft will burn up; come in too shallow and it would shoot them back into space. The Apollo 13 crew returned safely to Earth six days after takeoff. Most watch-lovers will agree that a genuinely rounded collection includes at least one Omega Speedmaster. Most Speedmasters adhere to the same basic recipe. They begin with a watch that is, regardless of its version, a highly desirable timepiece that will forever be able to lay claim to the title of “Greatest Chronograph of All Time”. They may be made of gold or ceramic or titanium, they may have dials of a different colour. They can sport logos from various NASA missions, bracelets, Velcro, or leather straps. They can have a manual movement or automatic, or, of late, one with the co-axial escapement. Suffice it to say, there are many to choose from, and to suit all tastes. And while Omega has played with the timepiece’s particulars over the years, the Speedmaster has never wavered from looking right for right now. The most recent timepieces to join this famous bloodline are the Dark Side of the Moon collection, expanding with four new models: Black Black, Vintage Black, Sedna Black, and Pitch Black; and the White Side of the Moon, named for the radiant portion of the moon as seen from Earth. (The Grey Side of the Moon, the metallic silvery-grey of lunar dust, was released last year.) What makes these watches possible is the use of forged ceramic to create the case parts. Creating the 44.25 mm Speedmaster case parts from the zirconium oxide (ZrO2) ceramic material is a demanding and time-consuming task that utilizes highly specialized processes at the Swatch Group’s in-house ceramic engineering facility. Intense heat is required to forge material blanks before laser and diamond tools are employed to brush and polish the tough surface. The Speedmaster case body is crafted from a single solid block of ceramic, and each element, including the bezel, case back, crown, push buttons, and strap buckle, is formed of the same material. The top and bottom of the ceramic watch case are scratch-resistant sapphire crystal and the Speedmasters are fitted with the Omega co-axial chronograph Calibre 9300 movement with a date-display located at six o’clock. The moon is a place we see at night; we can often even glimpse it during the daylight. Despite its proximity and familiarity, no human has set foot there in decades, and we’re not even sure how this place came into existence. The space race is over now. The Soviet Union no longer exists, and its descendant state, Russia, is now a key space-flight partner of the United States. The first lunar landing has been described as mankind’s greatest technological achievement. Speedmaster owners possess an object that has a true and tremendous story. One that encompasses human endeavour and human bravery and that, more than anything else, is made of true grit. NASA has set its sights on getting a human to Mars by 2030. A yet-to-be-conceived Omega Speedmaster will, undoubtedly, accompany that mission.